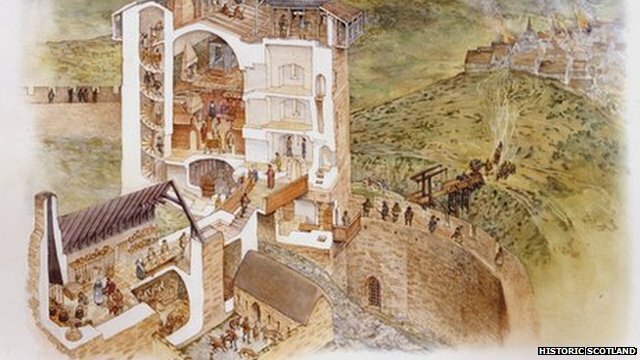 A medieval tower which housed kings and hid treasure was the first "high rise" in Edinburgh. 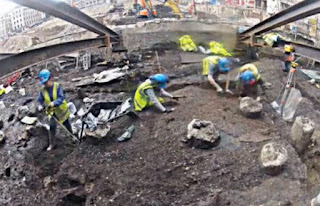 David's Tower was itself hidden beneath Edinburgh Castle until its rediscovery 100 years ago. BBC Scotland's arts correspondent Pauline McLean has had a look around. 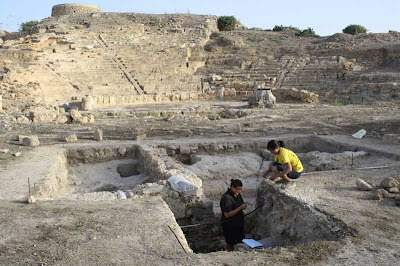 Fragments of marble sculptures from a monument consecrated to the nymphs of ancient Greek and Roman mythology have been uncovered during on-going excavations at Paphos' ancient theatre, the archaeological team in charge of the dig have announced. The 15th season of excavations into one of Cyprus’ largest ancient theatres unearthed a number of significant finds, including fragments of carved marble adornments from the stage and from a monument to the nymphs or nymphaeum. Paphos was the capital of Cyprus in Greek and Roman times and its ancient archaeological remains are on the World Heritage List. 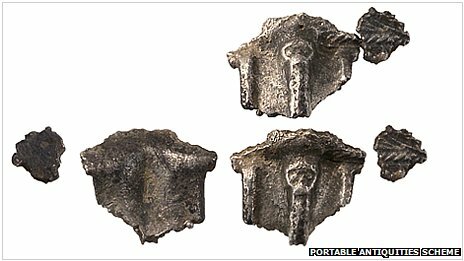 Bulgarian archaeologists have unearthed 40 silver coins during excavations in the second largest city of Plovdiv. The archaeological dig on the route of the new Cherrymount Link Road in Enniskillen could delay the opening until next August at an additional cost of over £2 million, it has been claimed. Just a week ago the Department of Regional Development announced that the by-pass linking the Cherrymount Roundabout with a new roundabout on the Tempo Road was due to open next March. 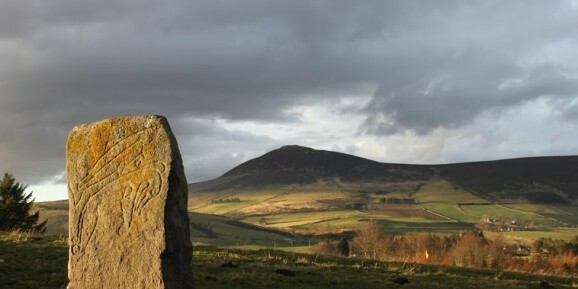 However, last Friday a number of public representatives visited the excavation of the Drumclay Crannog, the site of an ancient dwelling on the section of the by-pass between Cherrymount and the Coa Road. Ulster Unionist MLA Tom Elliott was among those who met the team of over 30 archaeologists involved in the dig. 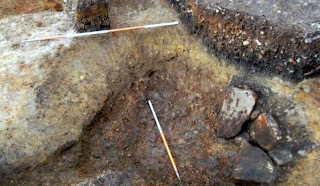 Iron, bronze and bone ornaments have been discovered at the crannog just outside Enniskillen, along with the chess-like pieces believed to have been part of the game. 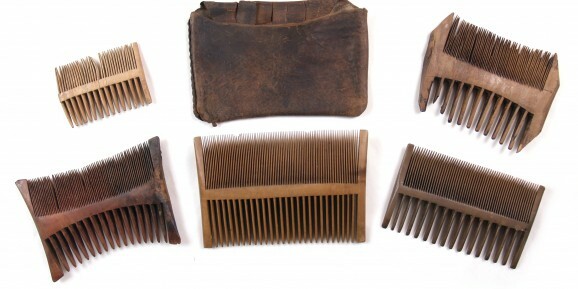 Parts of log boats, leather shoes, knives, decorated dress pins, wooden vessels and a bowl with a cross carved on its base were also unearthed during the six-month dig. Sadly, the erstwhile conservator for the Department of Greater London Archaeology, Sean A. MacKenna (Tony MacKenna), Tony died in October 2012. The most important project of his career was the excavation and restoration of the Winchester Palace Roman wall painting. Tony had published a detailed account of the work on his own website, but that website will not remain. The work is sure to be of considerable interest to Romanists and Conservators alike. 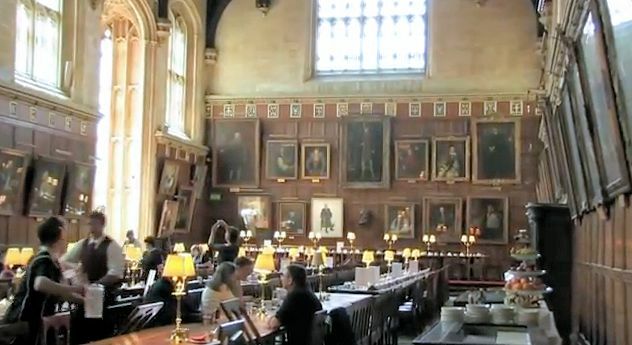 This short video, made by Paul Matwiy for the Oxford Experience, shows details of Cardinal Wolsey's Great Hall at Chrrst Church. This should be the best of times for Pat Sutherland. November’s issue of National Geographic magazine and a documentary airing Thursday night on CBC’s The Nature of Things both highlight research the Ottawa archeologist has been doing in the Canadian Arctic for the past dozen years that could fundamentally alter our understanding of our early history. If Sutherland is right, Norse seafarers — popularly known as Vikings — built an outpost on Baffin Island, now called Nanook, centuries before Columbus blundered on to North America. Moreover, there’s evidence they traded with the Dorset, the Arctic’s ancient, now-vanished inhabitants, for as many as 400 years. But Sutherland’s pleasure at the recognition her discoveries are receiving has been sharply tempered by a harsh reality. Last April, even as the documentary about her work was being filmed, the 63-year-old, then curator of Arctic archeology at the Canadian Museum of Civilization, was abruptly dismissed from her job. Tudor skulls, bones, longbows, arrows and nitcombs were among the array of artefacts examined by Bishopston Comprehensive School pupils as Swansea University academics showed how 21st century technology is shedding new light about life aboard the 16th century warship The Mary Rose. Nick Owen and Dr Sarah Forbes-Robinson from the Colleges of Engineering and Science visited the Year 8 pupils at the school to reveal how science and technology has helped them to discover more about the lives of the people on board Henry VIII’s warship which was sunk in 1545. Mr Owen, a Sport and Exercise Biochemist who has been working with The Mary Rose Trust, showed pupils his work on samples of skeletons that were raised with the ship from the Solent in 1982. Mr Owen’s research has focussed on the bones believed to be those of an elite company of professional archers who were known to have been on board the ship when it went down. Many of the skeletons show evidence of repetitive stress injuries of the shoulder and lower spine which are thought to be as a result of the shooting heavy longbows regularly. An ancient mummy who has been on display in the British Museum for over 100 years was a young man murdered by a killer who stabbed him in the back, new research shows. Scans of the ancient Egyptian, known officially as Gebelein man but nicknamed Ginger for his red hair, show that a puncture just beneath his left shoulderblade was made by his murderer. Forensic experts studied the scan on a 'virtual autopsy table' concluded that there is almost no doubt he was the victim of a deliberate, violent killing in peacetime. Daniel Antoine, the museum's expert on human remains, told The Times: 'His left shoulderblade is slightly damaged. 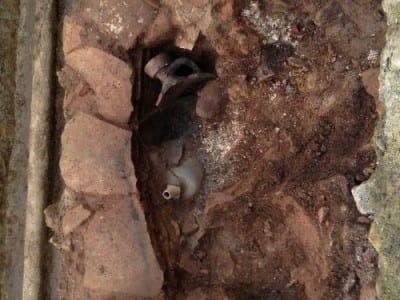 A ROMAN jug has been unearthed behind Estepona high street. A team of archaeologists discovered the ancient artifact yesterday morning close to the town’s shopping area. Sailing instructor Tomas Reyes spotted the organised dig outside his house and took the snap above. 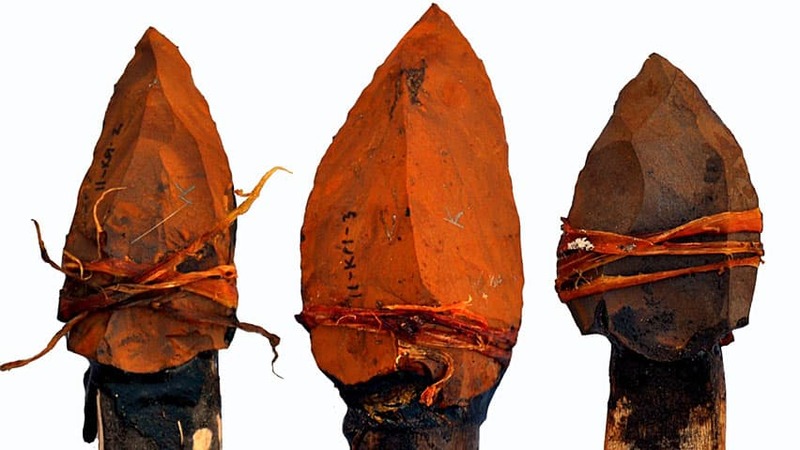 “It was very interesting, it must be at least 2,000 years old. “I asked if I could take a picture as they found it,” said Reyes. Romans used the containers to transport liquids such as water, wine, oil and honey. Project type: field school (excavations) THE PROJECT IS SUITABLE FOR BOTH BEGINNERS AND ADVANCED IN FIELD ARCHAEOLOGY! Project Venue: the spa village of Varvara, Southern Bulgaria is situated 14 km away from the site, in the foothills of majestic Rhodopi Mountains. There are several spa & wellness hotels and swimming pools with mineral water in the village that is also a stop on the picturesque narrow gauge railway (the last functioning one in Bulgaria) from Septemvri to Dobrinishte. Few people have ever visited the long network of underground tunnels under the public baths of Caracalla, which date back to the third century AD and are considered by many archaeologists to be the grandest public baths in Rome. 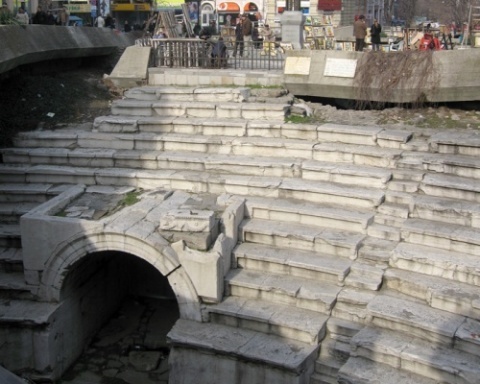 This underground network, which is due to be reopened in December, is also home to a separate structure, the largest Mithraeum in the Roman Empire, according to its director Marina Piranomonte. The Mithraeum has just reopened after a year of restoration work which cost the city’s archaeological authorities around €360,000. To celebrate the reopening, Michelangelo Pistoletto has installed his conceptual work Il Terzo Paradiso (the third heaven), which he first presented at the 2005 Venice Biennale, in the gardens surrounding the public baths. The work, made of ancient stone fragments and pieces of columns arranged in a triple loop, represents the harmonious union of the natural and technological worlds, according to the artist. It will be on view until 6 January 2013. Pyramids 3D app lets you fly across the Giza plateau with 360° views of The Great Pyramid, The Sphinx and the rest of the ancient complex. It gives aspiring explorers and armchair travellers an equally fulfilling way to sample one of the Seven Wonders of the Ancient World. But it’s once you enter the tombs that the app really comes into its own. Every inch of the network of passages has been rendered from real photographs; even the tunnels closed to real visitors are included. There’s a small HUD and flashlight indicator to show your direction of travel. Scroll around with one finger and tap to move forward down the passages. You begin to feel like a real explorer, but the somewhat creepy soundtrack is a little off putting. 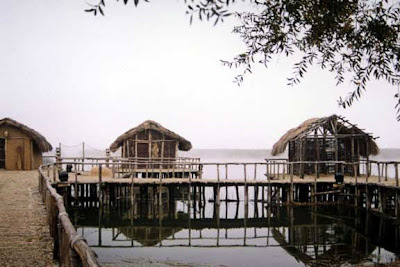 These are peaceful places where the pharaohs ascended to the gods, after all, not scenes from The Mummy! A company of elite longbow archers perished aboard Henry VIII's flagship the Mary Rose when it sank almost five centuries ago, scientists have discovered. Researchers have identified the elite archers who died alongside sailors on Henry VIII's flagship, due to evidence of repetitive strain in their shoulders and spines. The ship sank off Spithead in The Solent in 1545, while leading an attack on a French invasion fleet. It stayed on the seabed until it was raised in 1982 and put on public display. Over the past two years, scientists from the University of Swansea have been working to identify almost 100 skeletons kept at the Mary Rose Museum, in Portsmouth. DNA identification has been difficult because they have been contaminated by cockles, molluscs and algae. Nick Owen, Sport and Exercise Biomechanist from the College of Engineering at Swansea University said, “This sample of human remains offers a unique opportunity to study activity related changes in human skeletons. It is documented that there was a company of archers aboard when the ship sank, at a time when many archers came from Wales and the South West of England. 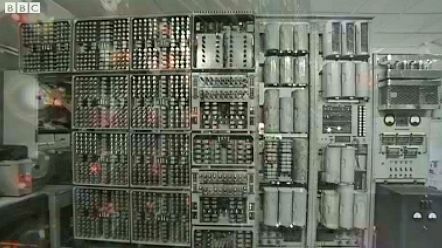 The world's oldest original working digital computer is going on display at The National Museum of Computing in Buckinghamshire. The Witch, as the machine is known, has been restored to clattering and flashing life in a three-year effort. In its heyday in the 1950s the machine was the workhorse of the UK's atomic energy research effort. A happy accident led to its discovery in a municipal storeroom where it had languished for 20 years. 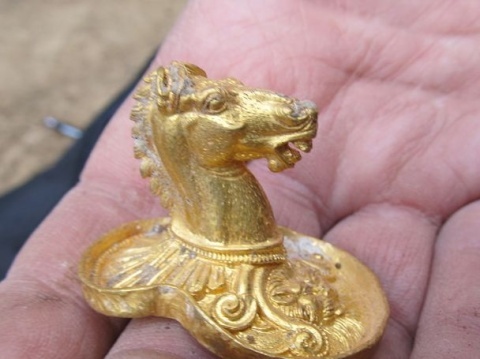 An object from the unique gold Thracian treasure recently discovered in Bulgaria. 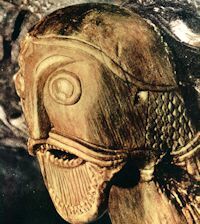 Residents of Bulgaria’s town of Isperih plan to launch a petition to have the unique gold Thracian treasure, recently discovered in the nearby famous Sveshtari tomb, to be returned to them. The news was reported by Standard daily, citing the secretary of the Town Hall. The precious find is now on display at the Archeology Museum in the capital Sofia, but locals demand from the Culture Ministry to have it back in Isperih. Isperih Mayor, Beysim Basri, has talked to the Director of the local museum, Boryana Mateva. 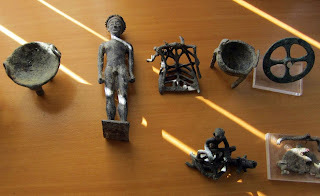 Together with the museum and the police, the municipality is committed to preserve both the treasure and the archaeological reserve Sboryanovo with the Sveshtari tomb since treasure hunters have shown huge interest after the latest find. The tomb is on the world cultural-historical heritage list of UNESCO. 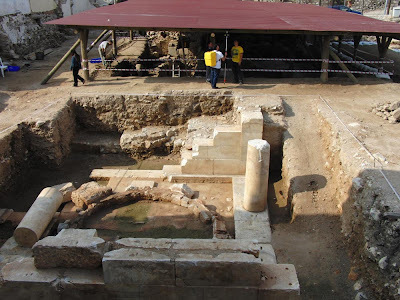 Mateva notes that according to the Cultural and Historical Heritage Act, archaeological discoveries must be transferred to the museum which initiated the unearthing or to the storage closer to the site. A cistern has been found during the archaeological excavation of King Hecatomnus' grave in Milas district of Muğla province in southwestern Turkey. The vaulted and rectangular-shaped cistern is located 100 meters from Hecatomnus' grave. "We suppose that it might be only one part of a complex of cisterns" the director of the Milas Museum, Ali Sinan Özbey, said, adding that this region will be opened for visitors as an archaeo-park when the excavation of the 2,400-year-old remains of Hecatomnus is finished. A significant part of the Cononian walls of Piraeus, which measured approximately 450 m in length, will be restored, aiming at the promotion of the remains of Antiquity at the Athenian port. 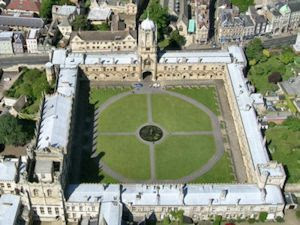 The restoration will be based on a new study, which has been approved by the Central Archaeological Council. The part which will be restored is located at the Themistocles coast, in front of the Cruise Passenger Terminal B of the Piraeus Port Authority, and beside the new conference and exhibition centre of the port. Apart from the restoration of the walls, the project includes the landscaping of the surrounding area for the accessibility to the outdoor spaces of the Kanellos Terminal. It should be noted that this terminal has recently been extended, in order to be used as a waiting room for passengers. The new sections also includes shops, restaurants, offices etc. A small bridge made of wood and glass floor, passing over the walls, will allow visitors to view them. The project also includes a minor intervention at the spot where the scarce remains of one of the fortification’s towers lie. 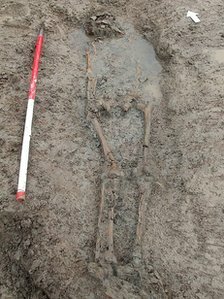 A Roman cemetery containing several human burials has been found during work on a new water mains in Somerset. 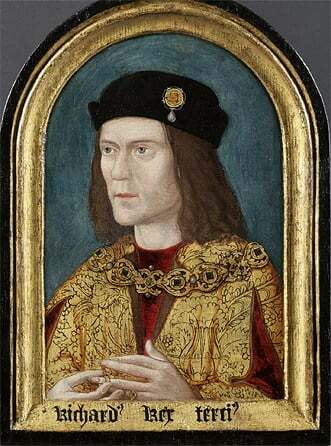 The finds were made by archaeologists during the laying of a four-mile (7km) long mains between Banwell and Hutton. Among the skeletons, which have been exhumed for further study, there was one in a partially-preserved coffin. A Bristol Water spokesman said the excavation had been described as "potentially the most important for 100 years in North Somerset". The cemetery was discovered "isolated from the surrounding landscape" in a curved water-filled ditch. Roman cemeteries, according to Neil Shurety from Border Archaeology, are generally sited outside settlements and away from areas of human habitation.